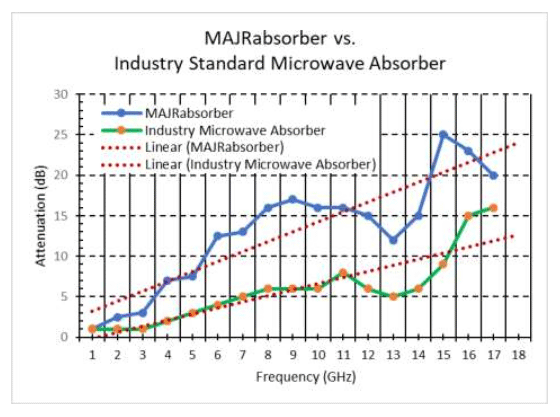 MAJRabsorber™ is the revolutionary RF broadband absorber material that is changing the way the industry thinks about broadband absorption. Only from MAJR Products, this proprietary material absorbs and dissipates stray noise in frequencies from 1 to 18 GHz with attenuation levels far above standard industry absorbers. Read about its many benefits and then let MAJR very quickly prototype MAJRabsorber™ to your specifications. Talk to us about your project and ask for a sample! MAJRabsorber™ is not just another entry into the absorber material marketplace. It is truly the next generation in RF absorbers. You can place it between circuit boards, creating improved circuit crosstalk immunity but, being non-conductive, the RF absorber material will not short out electronic components. The base RF absorber material exhibits higher EMI/RFI attenuation than others on the market that we have tested in the same thickness. Making it even more effective, the flexible center conductive layer provides an electromagnetically reflective surface that reflects EMI/RFI energy back through the RF absorber material. This absorber material is very tear resistant because of the flexible center conductive layer. This makes it easier to handle during production and more robust overtime. It very cost competitive because MAJRabsorber™ can be produced in roll form. MAJRabsorber™ works well under extreme temperature conditions and is non-conductive, corrosion resistant, highly resistive and can come with no pressure sensitive adhesive (PSA) or with PSA on one or both sides. Be sure and download a Data Sheet for MAJRabsorber™ to see more details about this product that is sure to become the new standard for microwave absorption – only from MAJR!